Laolu Akande, Osogbo: Nigeria’s future economic growth will be driven by small and medium-sized businesses, according to Vice President Yemi Osinbajo, SAN. Prof. Osinbajo said this during the launch of the nationwide MSME clinic in Osogbo, Osun State on Thursday. He added that the Buhari administration will continue to support small businesses nationwide through its economic initiatives. The Vice President further said that there are enough resources to go round if the country and its people use its resources well, while urging Nigerians to tap into the potential in their communities to create wealth through entrepreneurship and MSMEs. 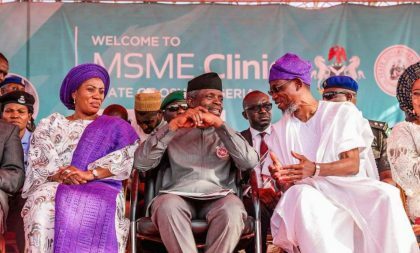 “It is pleasing to know that over 4,250 participants registered to take part in this MSME clinic and that there are nearly 206 exhibitors across the ago-allied, manufacturing and retail sectors,” Prof. Osinbajo said. According to the Vice President “The small business is the engine of growth of the nation. We are here today, and I have seen for myself all the progress that small and medium businesses are making. Also present at the event was Osun State Governor, Rauf Aregbesola; the Minister of Health, Prof. Isaac Adewole; Chairman, Federal Inland Revenue Service, Babatunde Fowler; among other government officials.